Students gathered to hear faculty speak on kingdom diversity. 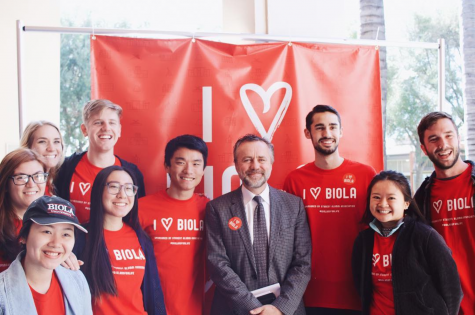 Students heard from a host of administrators, professors and students through brief talks and panels about Biola’s current place on the topic of diversity, things Biola needs to work on and advice for students on how to engage. 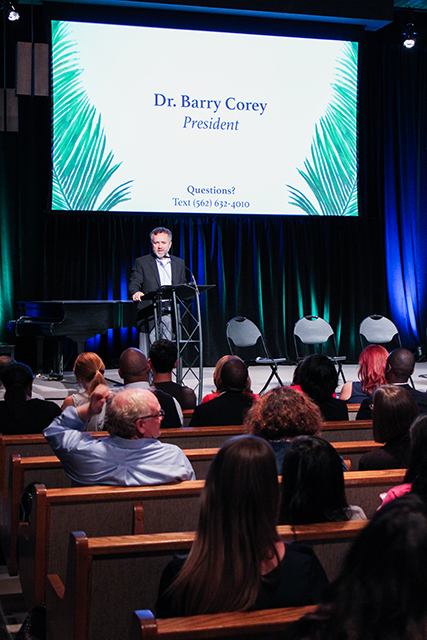 To further this honest, open dialogue on diversity at Biola, students attended “A Presidential Conversation: Living Out Kingdom Diversity” on Oct. 10 in Calvary Chapel. Many of the speakers discussed how the things happening now mark a first time for Biola on many diversity initiatives. “I learned that even though it is a Christian environment, discrimination is real, it’s a thing that has to be brought up in discussion,” said Jeli Villeza, freshmen public relations major. The night opened as President Barry Corey spoke for 40 minutes on the different steps of achieving the ethos of diversity for creating unity. The measures Corey shared included grounding the conversation in humility, giving people the space to make mistakes, prioritizing empathy, emphasizing social relationships over social media and seeing diversity in a more positive light. Within the point of prioritizing empathy, Corey discussed how people need to truly hear one another’s stories, lament, stand up for one another and mourn with those who mourn. Undeclared freshmen Isaac Chandler shared how he wants to apply the lesson of ethos of diversity. “Practicing empathy, I wouldn’t say I’m bad at it but I also wouldn’t say that there isn’t room to grow, there definitely is and… that’s just something I want to do personally and that I want to do as a follower of [Jesus Christ],” Chandler said. Moving away from steps in general for unity in diversity, provost and senior vice president Deborah Taylor and vice provost for inclusion and cross-cultural engagement Pamela Christian gave quick updates for eight minutes and five minutes, respectively, on Biola’s work on diversity and plans for the future. Taylor specifically shared on faculty and course changes, such as having the curriculum in first year seminar courses, New Testament and Acts include lessons on diversity from the theology of diversity to cross-cultural learning assignments. “Biola is on its way to changing the culture of Biola… there’s a lot more work to be done, but I can say with confidence that Biola’s taking the right steps in making that change possible. So, I’m excited to see the next 10, 15 years where Biola is at with that change,” said Tebraie Johns, senior communications major. Christian shared more general information about Biola’s course of action, including the art gallery exhibit titled “And Who is My Neighbor: Stories from the Margins,” increased requirements for faculty to attend the Student Congress on Racial Reconciliation and Campus Safety’s formation of a diversity council. In the next sections of the event, two sets of panels, moderated by chair of the communication studies department Joy Qualls, answered questions the audience texted in. The first panel included Student Government Association leaders and Biola professors. Nancy Wang Yuen, associate professor of sociology, shared she wants students to know their pleas are not falling on deaf ears and even if the changes are not apparent currently, changes are happening. The second panel consisted of administrators, including Corey, Taylor, Christian and associate dean of students Matthew Hooper to answer more pointed questions about what administration is doing to continue the conversation of diversity outside of these specialized events. One of the questions addressed why the discussion is happening just now. Corey mentioned how Biola has no good reason why the conversation did not happen sooner, but the point remains the conversation is happening now and Biola’s leaders are listening. The event ended with Glen Kinoshita, director of Imago Dei initiatives, sharing about opportunities on campus for students to get involved with the diversity conversation as well as students learning how there is birth in destruction. “I liked the last thing [Kinoshita] said, how growth can look like destruction, growth doesn’t have to be pretty, and lot of times that’s what we expect it to be, something that’s easy and smooth. But in reality, it’s not, and that’s how you actually get the good change but you have to go through the messiness,” said Angelina Orozco, undeclared freshman.